Are These the 3 Best Ways to Get Rich From Gold? 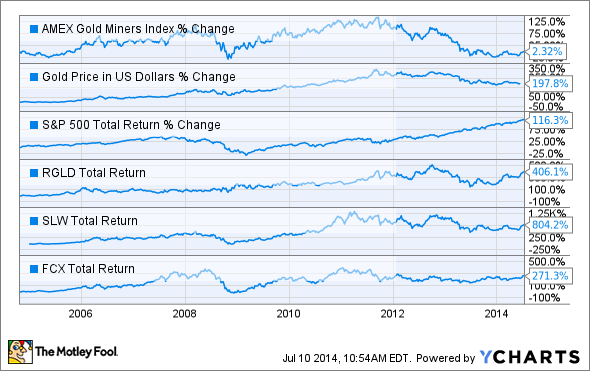 Investors wanting to diversify their portfolio into gold have typically chosen either gold miners or gold coins. This article explores three better alternatives that have proven themselves over time and could generate enormous total returns over the next decade. In the last decade gold has seen its price triple, yet investors in gold mining stocks have mostly been disappointed. The AMEX gold miners index is up only 2.3% including dividends, woefully underperforming the S&P 500's 116% total return. As the above chart shows, Royal Gold (NASDAQ:RGLD), Silver Wheaton (NYSE:SLW) and Freeport-McMoRan Copper & Gold (NYSE:FCX) have handily beaten the market, gold miners, and even the rise in gold prices. This article will explore why these three companies represent the best long-term way to get rich from gold. The investment thesis for Freeport-McMoRan consists of three parts: diversification, a strengthening balance sheet, and its potential as a major energy producer. Freeport-McMoRan is not only a miner of gold, but also of molybdenum, copper, and now an oil and gas producer. In 2013, Freeport acquired $19 billion in oil and gas resources, leaving it with $19.7 billion in current debt and 861 million barrels of oil equivalent reserves and 176,000 barrels/day (13.4 years) of production. Freeport-McMoRan is currently planning on lowering its debt by 61%, to just $12 billion, by 2016. This will immensely strengthen its balance sheet, although at a interest coverage ratio of 27.4, Freeport-McMoRan is already one of the most financially sound miners in the industry. In order to achieve this immense debt reduction Freeport-McMoRan is selling off certain assets such as some of its acrage in the Eagle Ford shale and its Candelaria copper mine, and it's investing in more promising areas such as the Haynesville shale and deepwater oil assets in the Gulf of Mexico. Despite these sales Freeport-McMoRan still plans to expand its copper production by 39% from 2013 through 2016 thanks to expansion at five megamines capable of producing over 1 billion pounds of copper annually. Analysts are expecting massive earnings growth acceleration from Freeport-McMoRan over the next decade due mainly to its energy segment, which is expected to account for 32% of 2014 EBITDA. With its 5 trillion cubic feet of natural gas in the Haynesville shale ideally located to serve America's coming LNG export boom and its high quality deepwater gulf assets, Freeport-McMoRan's energy segment will drive strong growth in its generous yield and long-term share price. Royal Gold operates with my favorite business model for precious metals. It acquires royalty rights and streams excess capacity from regular miners. This means it pays an upfront fee in exchange for a percentage of a mine's production, but usually at substantially reduced rates. Royal Gold essentially acts like a financier for miners, something that is necessary since the cost of a new gold mine has soared 311% to $2,300/oz in the last decade. Royal Gold maintains minimal overhead and is requires no capital expenditures or exploration risk. Its low costs make it one of the most profitable companies in its industry, with a net margin of 25.6% compared to a negative margin for its average peer. Royal Gold has surged 86% in the last year, due to signing major contracts with miners that will increase gold production 65% this year. The current valuation is 68% above above its 21-year average, which is why analysts believe the stock will underperform over the next decade. My advice to interested long-term investors is to put Royal Gold on a watch list and wait for a pull back, inevitable in a cyclical industry such as this. Silver Wheaton is my favorite way to invest in both silver and gold for three reasons: valuation, very low costs, and superb growth prospects. In 2011 Silver Wheaton's production was 97% silver, but gold is expected to make up 31% of production and 33% of revenues by 2018. Silver Wheaton's production of silver and gold is expected to increase by 35% and 61.3% respectively by 2018. With its ultra-low cost for of just $4.12/oz for silver and $386/oz for gold, Silver Wheaton is poised for immense growth in the next decade should silver and gold recover. With a 48.3% net margin and a low payout ratio of 34%, Silver Wheaton has the potential to be a strong dividend growth stock over the next decade as well. The best way to profit from gold is to invest in companies that have proven operational leverage to the price of gold, low costs, and or diversification into commodities with strong growth catalysts such as oil and gas. The highest profit margins belong to precious metal streamers such as Royal Gold and Silver Wheaton. Silver Wheaton makes a better buy today due to a historically low valuation, but Royal Gold deserves a place on your watch list. Freeport-McMoRan is a great way to invest in the overall growth of the global economy and pays a generous dividend that's likely to grow quickly over the next decade, resulting in market-beating total returns.